When sunny summer days arrive, you want to spend as much time as possible outside. The easiest way to make any space stand out is to add some color. That doesn’t necessarily mean you have to go with a bright paint color on the outside of your home, though. There are a ton of ways to incorporate bright hues into your outdoor space without doing a complete overhaul of your home’s exterior. A great place to start is by adding some lush flowers and plants. Choose some pretty planters and pots to plant them in, and try to choose flowers that work with the color palette you’ve created. It’s also smart to choose things that bloom at slightly different times, so you’ll always have some flowers out. Once you’ve planted everything, you can sit back and let nature take care of the rest! Another great way to add some bright elements is by choosing some smart accessories. For your front porch, look for a cute doormat, door knocker, or some window boxes for planting flowers. You can also use lighting elements like colorful lanterns to help create some visual interest. On your patio or backyard deck, make your outdoor furniture look cozy and colorful by adding some bright throw pillows in a sturdy outdoor fabric. If you want to make a concrete floor seem more stylish and welcoming, add an outdoor rug in an interesting print. You can also use outdoor flooring tiles to create a more elevated look. Again, you can add some color by choosing fun and bright accessories like lanterns, candles, small statues, and more. If you want to give your outdoor space a fresh new look, paint is a quick and easy way to do it. Don’t worry, you don’t have to commit to a whole exterior paint job! What most people don’t realize, is that a few subtle updates can really make a huge difference. If you want to make a dramatic impact, painting your front door is the way to go. This is a fabulous way to instantly update the look of your porch. This is the perfect place to go wild when it comes to choosing a color—bold colors like red, bright green, yellow, and even purple will add some serious impact. Just make sure the color you choose complements the base color on your house. If you’re not sure which colors will work best together, we suggest taking a look at a color wheel for some inspiration. 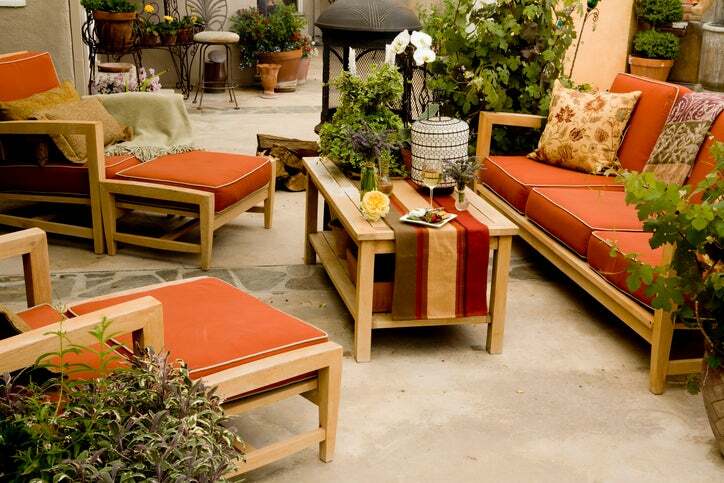 You can also add a pop of color by painting your outdoor furniture. This works well for all types of furniture, and you can usually find special paint to use on every type of surface, from wicker to metal, and more. For color inspiration, you can go with a classic bright white, or soft and subtle pastels. Of course, neutrals like soft gray also work well. To create a more eclectic and exciting style, try playing with some bright and bold hues like brilliant yellow, red, or green. For a truly unique look, try painting the ceiling of your porch for an unexpected hint of color. For a relaxing, dreamy feel, go with a light sky blue color. You’ll mimic the feeling of sitting under a gorgeous blue sky. Really, any pastel color would be a good choice. Of course, you can always try experimenting with a bright ceiling color if you want to create a different vibe. You can also use paint to highlight the natural colors present in your yard. Take a look around and see which plants stand out to you. Do you have red flowers that you really love? Paint red accents on trim, shutters, or window frames to bring them out more. This works for any colors, from soft lilac, to bright and bold blues or yellows. Another cool and creative way to play with color is to paint your porch floor. Neutrals work best for this look, with soft grays or more subtle hints of blue working best. 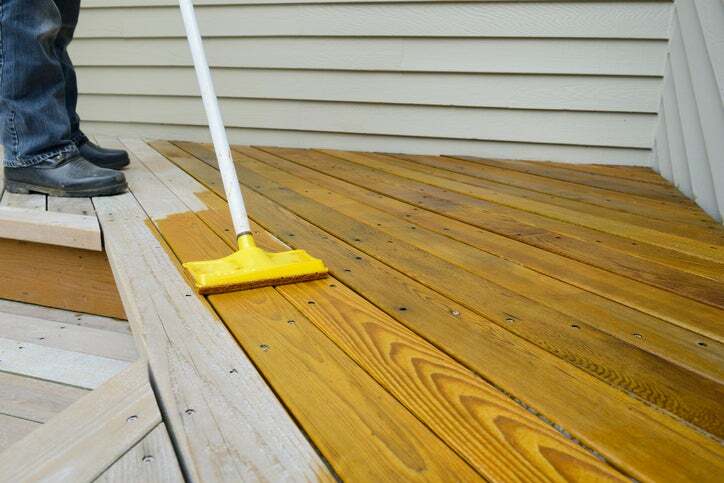 If you’re after a more natural look, use a wood stain instead. This gives you a more subtle hint of color and lets you show off the natural grain of the wood. If you want to get really creative, you can use stencils to create a pattern on your porch floor. This would make it feel more like an area rug, and is a much more fun and interesting look. Any of these suggestions are perfect for updating your front or back porch. 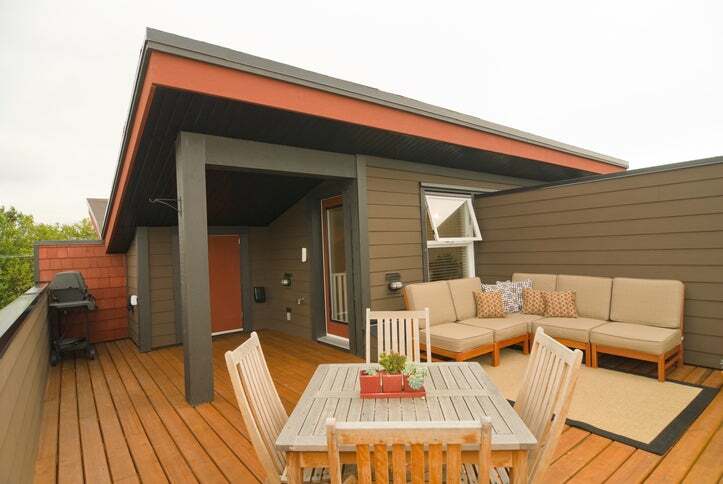 Of course, the type of porch you have can dictate the style you go for. 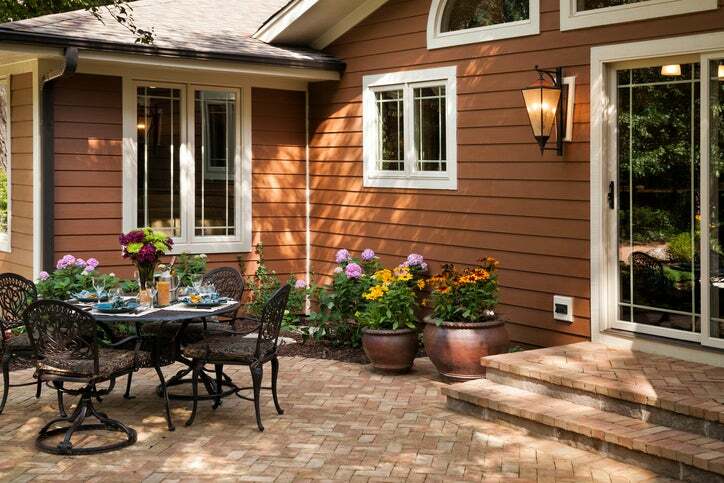 If you’ve got a more private backyard, you can create looks that are a bit more open and natural. Whereas, if you have a more open city-style space, you’ll probably want to add elements that will create some privacy, such as curtains or lattice work.